Pang Dow was torn away from her mother as a baby, forced to walk for miles on busy streets fighting heavy traffic and begging for money from unwitting tourists. When she got bigger, she was sold to a trekking camp where tourists weighed down her back for hours on end. As if this wasn't enough, she was then used in illegal logging lifting and dragging heavy loads all day every day. World Animal Protection is working to end this cruelty by showing the industry there is a different way. By raising awareness about the hidden cruelty behind elephant rides and shows, we are helping people make elephant friendly travel choices and putting pressure on the travel industry to change for the better. 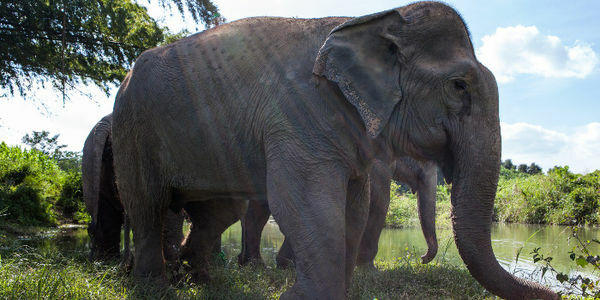 'Pang Dow' means lucky star, but this poor elephant has endured more abuse than most. She has been rescued and cared for at BLES sanctuary in Thailand, but her body still shows the brutal wounds and damage done during a lifetime of exploitation and neglect. She has a broken ankle that never healed properly causing a significant limp, and a fungal skin infection that caused itchy spots and scars all over her body that will be a permanent reminder of her suffering. Pledge to defend elephants by never riding one. Your signature will send a clear message to the travel industry that you won't stand for this cruelty.